While paying tribute to his community in protecting their traditional religion, culture and environment of, the democratically elected leader Sikyong Dr Lobsang Sangav spoke about the difficulties the Tibetan community is currently going through under Chinese occupation. 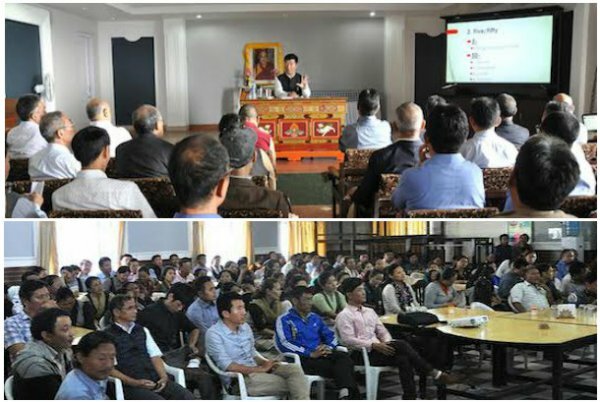 Speaking at a gathering of Tibetan officials and staff in Dharamsala, Dr Sangay spoke about the status of the area in light of recent global events and political dynamics. Speaking at a gathering of Tibetan officials and staff, in Dharamshala, India, Sikyong Dr Lobsang Sangay Monday said "Tibetans inside Tibet have shown immense strength and unity in protecting the religion, culture and environment of Tibet." Hundreds of officials and staff of the Central Tibetan Administration (CTA) gathered at Nyatri hall, Gangchen Kyishong, Dharamshala, India, on August 8, to listen to Sikyong Dr Lobsang Sangay, the democratically elected political leader of Tibet. Sikyong spoke about the status of Tibet and of Central Tibetan Administration in the light of recent global events and the political dynamics. "Tibetans inside Tibet are sacrificing their precious lives to protest the wrong policies of the Chinese government. In spite of Chinese repression and control over their daily lives," the political leader said. "Tibetans inside Tibet have shown immense strength and unity in protecting the religion, culture and environment of Tibet," Dr Sangay said, adding: "We must also reinforce our commitment and efforts as a responsible member of the Central Tibetan Administration." Sikyong strongly called on the entire staff and officials of the CTA, to forge a united effort to realise both the short and long term goals of the Tibetan people, said an official post on Monday, citing the elected political leader of Tibetan people. "The five-fifty strategy calls for a renewed effort in the Tibetan people's struggle to seek genuine autonomy in the next five years while strategising to strengthen and sustain the Tibetan movement over the next fifty years," Sikyong said while reiterating the strategy of five-fifty and outlining the policies and plans of the 15th Kashag. "If Tibetans are able to survive, strengthen and sustain the Tibetan administration in the next 50 years, it will be able to restore basic freedom of the Tibetan people," he added, while providing the prospects of changes in China. Sikyong also spoke about the political developments in China, developments in the international political scenario, prospective changes in the coming years and its possible impact on the Tibetan movement.